The Florida Association of Destination Marketing Organizations' Destination Marketing Summit was created to provide networking and training for DMO staff on leading edge innovations in tourism marketing training, convention sales, industry relations and technology. 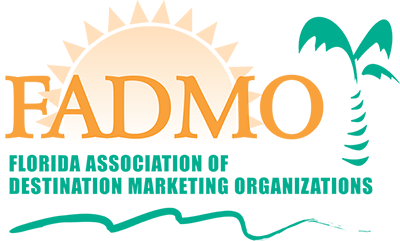 DMO members, affiliated partners, advertising agencies and other vendors interested in educating and networking with DMOs are invited to submit presentations for the 2019 Destination Marketing Summit taking place at the Hutchinson Shores Resort in Jensen Beach, Florida, May 22-24, 2019. What our message should be and how are we selling our destination. Reaching /Training tourism partners ... ie hotel front desk staff, restaurant staff, small business, etc. to understand the importance of being frontline tourism ambassadors; reaching hoteliers to understand the importance of tracking visitors, why they are in town, where from, etc. A forecast of what the visitor to Florida might look like 5 years & out from today. How the rest of the DMO's are doing. Gathering data for strategic marketing responses to unexpected events such as Zika and Red Tide. International Tourism - Who's coming to Florida? Technology Searches – what on the horizon? On Thursday, May 23rd, there will be 2 concurrent sessions totaling 12 hours of programming. We are looking for several sessions delivering detailed tourism marketing, convention sales, industry relations and technology education. DMO members are encouraged to submit presentations sharing your successes and challenges over the past year. One of the best ways our members learn is by sharing with each other what has worked well, as well as what you have learned from your challenges. Affiliate members, advertising agencies and other vendors interested in educating and networking with DMOs are also encouraged to submit presentations to let DMOs know what valuable products and services are available, and how you can help them address their challenges. Presenting to FADMO members is a terrific business development opportunity and a way to increase your visibility in the Florida tourism marketing industry. All presentation submissions are reviewed by our DMO members in a member survey and the top-rated presentations are selected for the program. If selected, you will be featured in the event brochure as an expert and given expert status at the event. Please note that we may video record your presentation. If we record your presentation, we will provide you a copy of the video for your use. Please email [email protected], or call 850-222-6000 if you have any questions.